We are a prominent name engaged in supplying leather testing equipment which easily meet with all the specific requirements of the client. 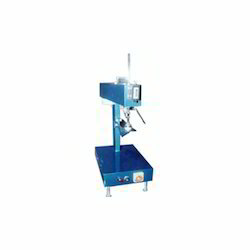 Having compact design and defect free structure, these equipments deliver long lasting performance. 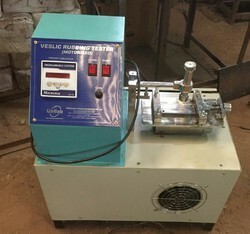 We are offering Veslic Rubbing Tester. The resistance of surface finish and colour of leather to the action of rubbing such as may occur when shoes are rubbed to materials. Used for evaluating the change in colour produced with the help of standard grey scale for change in colour. 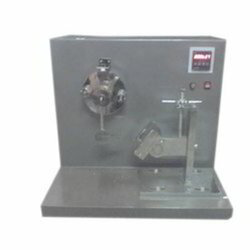 We are offer Fatigue Resistance Tester. The ability of elevated heels of ladies shoes and sandals to withstand repeated lateral impacts without breaking off is determined by holding the heel in a suitable holder and giving repeated impacts of specified impact energy near its lower edge. The test is continued till the time the heel fractures, or till a total number of 20,000 impacts is given to the heel under test. The number of impact after which the heel fractures gives a measure of the fatigue resistance of the heel under test. BS 5131 (sec 4. 9) -1991 : Method of test for footwear and footwear materials section 4 . 9: fatigue resistance of heels of ladies’ shoes. Unilab Flexometer is built on a rigid metallic base plate. Test specimens are held between a pair of stationary and oscillating grips. The grips are specially designed to enable quick fixing and removal of test specimens and are shaped to meet the specification of the test. In this test, test specimens in shape of rectangular pieces are folded and clamped at each end to maintain them in a folded position in a set of grips, one of which is fixed while the other is able to oscillate. The movement of the oscillating grip causes the fold in the test specimen to run along its centre. This operation is carried out repeatedly and the test specimens inspected periodically to assess the damage produced. The equipment used for this test is called as flexometer. 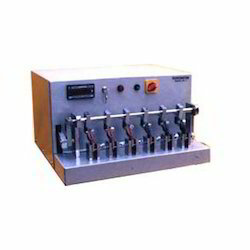 Leather industries require Rub Proofing Tester for determining the color fastness of leather. The specimen is subjected to pressure to create a standard condition of usage. 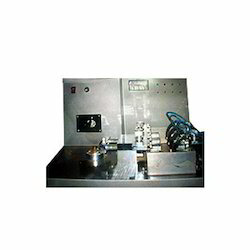 The machine has an interlock front door to ensure that the particles do not fall out of the tester and there are no chances of contamination after exposure to outside environment while testing. Load and Distention are shown in Digital Monitor. 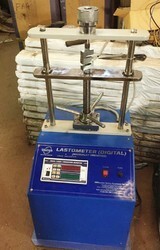 Water Proofing Tester determines the extent to which the leather is resistant to water. The specimen is dipped in a water bath till the sample reaches its threshold. It enables to record the absorption and penetration of water in the sample and determines the resistance of the sample to water. It measures the dynamic water penetration of leather shoes and accessories.